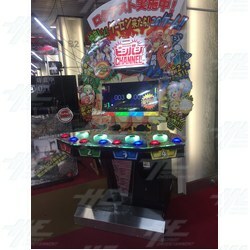 Bishi Bashi Channel is Konami Amusement's newest addition to their series of video games for arcades, mobile phones, PlayStation and Windows. The competitive video game, while still incorprating the same BISHI BASHI game elements, now includes a variety of mini-games. It also has a multi-language function, meaning players who speak other languages can be involved. The language function includes English, Japanese, Chinese and Korean. One cabinet allows four players at once to verse, or two teams of two. Bishi Bashi Channel is Konami Amusement's newest addition to their series of video games for arcades, mobile phones, PlayStation and Windows. The competitive video game, while still incorprating the same BISHI BASHI game elements, now includes a variety of mini-games. It also has a multi-language function, meaning players who speak other languages can be involved. The language function includes English, Japanese, Chinese and Korean. One cabinet allows four players at once to verse, or two teams of two.